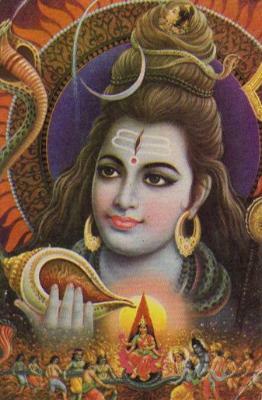 The Tantric finds in Shiva the Deity of love, living and vibrant reality, full of spontaneous energy, a divine force whose presence he perceives directly, but whom he considers as a person: “you are the great being (mahapurusha), the unique, refuge of all beings”. The great mystic poet Utpaladeva addresses to Shiva: “you are the Splendid Being (adhipurusha), permanently awake in a sleeping world.” In fact, Shiva does not have any observer but himself. He cannot be an object of human perception for He is the Supreme Subject himself, that which is attained by the beings who reach the top, the knower of the knower, the only Subject who is truly and totally conscious. For the Tantric metaphysics, the Absolute Reality encloses /comprises within Itself all dualities and polarities reunited, reintegrated in a state of absolute Unity. Creation and all development it implies represent the destruction of primordial Unity and the separation of the two principles (Shiva-Shakti, etc. ); the suffering, the illusion, the slavery we experiment as human beings consist precisely in this acute state of duality (subject-object, etc.). The purpose of Tantric sadhana is to reunite the two principles inside the disciple’s own heart and body. Leaving aside the metaphysical and intellectual problems rose by the simultaneous transcendence and immanence of the Divine, we will now mention the different aspects of Shiva, as transmitted by the tradition of purana-s and agama-s. 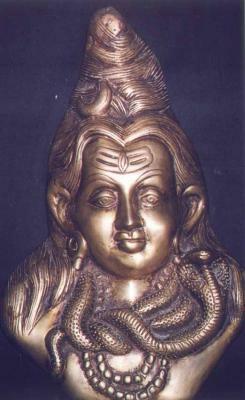 These aspects of Shiva are essential guidelines in the understanding and practice of Tantra. Shiva is also the deity of compassion and infinite grace. As Pashupati, he is adored as the shepherd of the souls subdued by ignorance, which he protects and constantly impels towards reaching the supreme freedom. This aspect of Shiva portrays the Deity of Love, the beloved husband of the essential creative divine energy/ cosmic mother, named Shakti, Uma or Parvati, whom he eternally embraces. To this universal love between the two cosmic principles corresponds on a human level, the happiness and ecstatic beatitude of two hearts that share ardent feelings of love. As Virupaksha or Trilocana, Shiva is endowed with a third eye, terrible and mysterious, destroyer of duality and death, but at the same time the eye of infinite compassion which radiates permanently divine happiness and love. For yogis, Shiva appears sometimes as the archetypal hermit, symbol of detachment and transcendence, the Supreme initiator in Yoga and Siddhi. Shiva, in his aspect of Dhurajati reduced to ashes the God of sensuous love owing to the perfect sublimation of sexual energies on the level of Ajna chakra (the third eye), while practicing yogic techniques beside the Parvati’s pyre, symbol of the transcendence of all that is evanescent and transitory. But from that moment on, he is the terrible Bhairava, dreading for the egoistic and ignorant. He is depicted completely naked, (owing to the fact that he is beyond all forms, determinations and attributes). Finally, Shiva is the Cosmic Dancer, who creates and destroys the universe through his impetuous, terrible or impassioned movements or which he sustains by means of his own harmonious rhythms. The fully liberated being takes part as well to this sublime ballet, dancing spontaneously and freely along with all universal phenomenal manifestations and energies because now he is perfectly integrated in the secret rhythms and cycles of Nature. He is dancing now with the whole of creation, with Life itself, in its multiple aspects, which he recognizes now as expressions of the divine energy, Shakti. 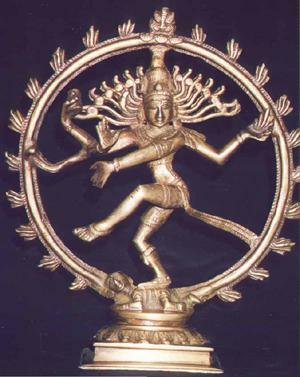 For millenniums, Shiva Maheshvara was worshiped on the whole Hindu territory as the Dancer, the Supreme Master of the Creation’s rhythms and vibrations. Through his dance, by means of his hand gestures (mudra) and the symbolic objects he holds, he expresses the most disparate and apparently incompatible aspects of Life. As the cosmic Dancer, he dances holding a tambourine and wearing bells at his ankles. As a hero (Vira) he victoriously waves a trident above his head. As a hermit, he is anointed with the ashes of the universe, wears his hair in a loop, and has snakes as ornaments. As a destroyer of human ignorance and misery, he is armed with bow, arrows, sword and bludgeon. As a shepherd of his herd, he holds a noose, a stake to prompt his herd and a hook. As the supreme Sovereign of the universe, shining in glory, he weook. As the supreme Sovereign of the universe, shining in glory, he wears the signs of this sovereignty: the white umbrella of the full moon, the Milky way fan, the celestial Ganges springing from his hair, which gives birth to the universe and keeps it alive. As Supreme Yogi, he wears the blinding brightness of his cosmic body, having a crescent moon in his hair, while the third eye is open on his forehead. Thus, Shiva, the masculine universal principle, may assume different forms and faculties in order to fulfill the aspirant’s most ardent and profound desires. 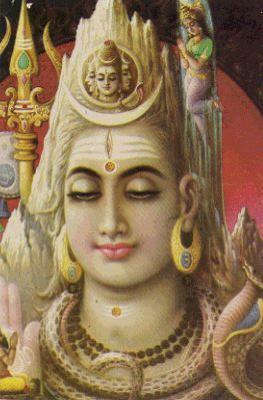 Nonetheless, in the Tantric view, Shiva does not remain distant, somewhere in the clouds, looking down to his devotees. He is to be found in he very heart of every human being, in every act of compassion, learning, right guidance, and ardent aspiration towards spiritual perfection. And moreover, he is not limited to all these. Join us again in order to find out the ways to recognize and love Shiva at a human level.